Start Planning Early. This is 100% the most important thing you can do to ensure a flawless New Year’s Eve. From purchasing tickets to making an appointment at a local salon for the days preceding NYE – the early bird gets the worm! Many venues and events offer discount rates if you purchase tickets to their New Year’s Eve party early. Ticket prices tend to increase as we get closer to the date, so plan early and reap the benefits! Further saving can be accrued by purchasing tickets in bulk, so start organizing your group of friends ASAP to take advantage of group rates. If you are hoping to secure a hotel room for New Year’s Eve it is vital that you reserve early. Locations will be filling up fast once December hits. 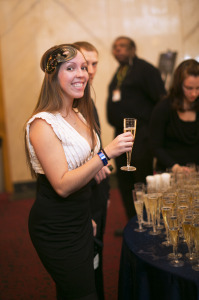 Visit NYEDetroit.com for a concise list of NYE parties and hotels in Metro Detroit. Save Money Where You Can. If you’re in the market for a fabulous New Year’s Eve outfit, keep an eye out for sales. Both local boutiques and national retailers will be running plenty of sales throughout the holiday season. Check out retailmenot.com for updates on sales and coupons. Scout Out Pinterest For Ideas. Pinterest is chock-full of clever and creative ideas for every facet of New Year’s Eve. Want to learn how to do the perfect smoky eye or find the perfect sequin dress? Look to Pinterest to take your NYE to the next level. Plan A Pre-Party. Get a group together for dinner and drinks before heading out for NYE or invite everyone to your place for appetizers and cocktails (check Pinterest again for festive and fun recipes). From there you can carpool or grab an Uber/Lyft/Taxi as a group. Stock Up On Afterparty Snacks. To combat a New Year’s Day hangover, take the time to stock up on plenty of snacks and hydration. Planning your munchies ahead of time can also help combat overindulging in junk food. Fill your fridge with fresh veggies, fruit, and a case of Gatorade. Or throw a couple of frozen pizzas in your freezer and call it a day. Secure Your Midnight Kiss. If you’re interested in someone, now is the time to ask them to join your New Year’s Eve entourage before they make plans. Every year millions of bottles of champagne are popped on New Year’s Eve, but what makes this effervescent beverage so appealing? Here are a few fun facts to stoke your interest. • All Champagne is sparkling wine, not all sparkling wine is Champagne. This is due to that fact that the name “Champagne’ designates the region of France where it’s produced. • According to her biographer, Marilyn Monroe once took a bath in champagne. 350 bottles were required to fill the bathtub. • The longest recorded distance achieved by a popped champagne cork is 77 feet. • Champagne is generally carbonated white wine, with a few exceptions. Australian Sparkling Shiraz, Portuguese Espumante, and Spanish Cava are three examples of sparkling red wines. • Champagne ranges from Brut (dry) to Doux (sweet). • Serving Champagne chilled prevents foaming and the loss of wine. • It’s speculated that carbonation helps alcohol reach your bloodstream faster. Chugging champagne almost ensures a headache, hence the recommendation to sip. • Flute glasses are specifically designed to keep champagne carbonated for longer. • Dom Pérignon was a French Benedictine monk traditionally credited with discovering Champagne. According to legend, Dom Pérignon exclaimed “Come quickly, I am tasting the stars!” with his first sip. • There are approximately 50 million bubbles in a standard bottle of champagne. • A popped champagne cork can reach speeds of around 40 mph. • The pressure in a corked bottle of champagne is around 90 pounds per square inch, or roughly 6 atmospheres of pressure. Everything about NYE can be improved with a little forethought. Figuring out what you’ll be wearing on New Year’s Eve can be frustrating, especially if you leave it until the last moment. To avoid stress, get yourself on Pinterest TODAY. Ideas for outfits, hair, makeup, and nails are in overabundance and cater to every style and personality. Planning early can also ensure more designs and sizes when you start shopping around. Avoid rushing to get ready or arriving to the party late by giving yourself ample time to get ready for the evening. If you think it will take you 3 hours to get ready, than give yourself 4. Starting early allows you to take your time and relax before leaving the house for the evening. It also prevents you from becoming the person everyone has to wait on before they can start partying. Is there anything sadder than watching a woman in pain shuffle around a party in skyscraper heels? If you can’t walk in a pair of shoes with confidence, then don’t wear those shoes. I don’t care how pretty those Louboutins stilettos are, if you’re in pain or shaky on your feet then you aren’t looking your best. If you simply must wear those shoes, then pack a backup pair. Dr. Scholl’s offers a product called Fast Flats that are precisely for this situation. ‘Tis the season for fake eyelashes and everything glitter. Want to go black tie? Mention NYEDetroit.com for a 50% discount on suits from President Tuxedo. After a strenuous holiday season, take the time to show yourself a little TLC. The days leading up to NYE are the perfect time to add highlights to your hair or get your nails done. If you have a limited budget, head to Groupon for plenty of savings on local salons. Is there a better way to celebrate and encourage Detroit’s renaissance than by spending New Year’s Eve downtown? Whatever kind of party you are into, it can be found within city limits. 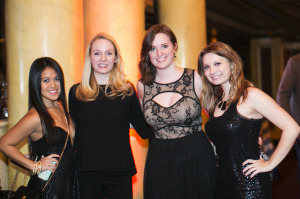 Interested in mingling with like-minded young professionals in a classy setting? 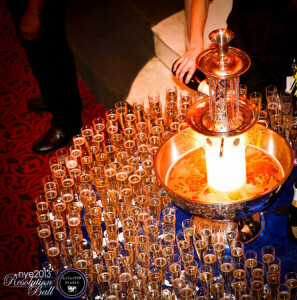 Try The Motor City Gala at the exclusive Atheneum Hotel in Greektown. Looking for a rager with plenty of entertainment and a crowd? 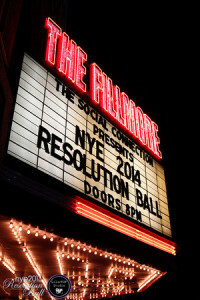 Checkout the annual Resolution Ball at the Fillmore Detroit Theater. Families with children may want to head to Campus Martius this NYE for the annual “D” Drop. From Campus Martius to Greektown, NYE is an opportunity for Detroit to showcase its rebirth. Expect the streets and sidewalks to be teeming with Detroiters looking forward to ushering in the New Year. After so much change, who knows what the future can bring for our beloved city! New Year’s is a time to allow for better and smarter life choices. Kick off 2015 by making the best decisions for you and your rock star body; no more hangovers! Once the bubbly is done pouring and the confetti is thrown away, the last thing you want to feel is like the DJ has personally followed you home and set up in your brain. Follow these tips to ensure you have a relaxing and enjoyable New Year’s Day. While eating doesn’t necessarily mean you will avoid a hangover, it can definitely help. Digesting foods will slow the absorption of alcohol into the bloodstream. Most New Year’s Eve parties will have out hors d’oeuvres for guest to snack on. Many NYE parties will start as early as 6:00 or 7:00 in the evening. That means you’re going to want to run a marathon not a race. This will help your to drink less and also allow your body to absorb the alcohol already in your system. It is no surprise that our bodies love H2O. They love it even more when they need it the most, during dehydration which is exactly what is happening while you’re drinking alcoholic beverages. Try alternating between a small glass of water and a cocktail, or even replacing pop and juice with water or soda. Make sure to keep a glass at your bedside when you return home at night. Whiskeys, bourbons, scotch, and some tequilas have higher concentrations of toxins called congeners. These toxins only add more severity to your hangover. If you’re going to go with the hard stuff, stick to light liquors such as vodka and gin. Not only will you be having a long night of dancing and mingling with friends, your body will be having a long night and following day trying to replenish itself. Try to sleep as soon as your home and take a nap the next day to let your body rest as much as possible. It will be no surprise if you wake up to a pounding headache after your long night of partying. Try taking aspirin or ibuprofen to ease the pain, and only in the morning. Your blood will already be thinned from the alcohol so mixing with pills while the liquid is fresh in your system at night can be a very dangerous idea. You should already have been drinking lots of water the night before, but you shouldn’t stop once morning hits. Your body will still be dehydrated and thirsting for extra water. Sports drinks such as Gatorade and PowerAde are great alternatives also to give your the extra electrolytes. Your body will nutrients to feel better. This time around carbs will be your best friend and make you feel great. Also, foods with high protein will help to ease the pain. Have a banana ready for you in the morning and nice hearty breakfast. No not more alcohol. Smoothies, natural juices, and coconut water are all great options to help cure your hangover. All three contains antioxidants, sugar and water! Plus you may be feeling too queasy to actually scarf down some eggs and bacon. The reason you are feeling so crappy is because your body is full of yucky toxins. A fast and easy way to get rid of those is to sweat it out. Put on your running shoes, get some fresh air and rid your body of the things it doesn’t want. – One of the best parts of going out on New Year’s Eve is the people watching. Just sit back, sip on your champagne, and enjoy the pageantry. Glamorous dresses and what-were-they-thinking messes, fights, and drunken meltdowns are but a taste of what going out on New Year’s Eve can offer. – If you are someone who likes getting dressed up, then New Year’s Eve is one of the most important nights of the year. There’s just something empowering about knowing you look good. You can survive those uncomfortable shoes and that slipping strapless dress when you’re bringing your fashion A-game. – New Year’s Eve is an excuse to buy a new outfit or splurge on a glitzy accessory. It may not be the wisest financial choice in lieu of holiday spending, but that’s why you got a credit card, right? – Love glitter? New Year’s Eve is the only acceptable time when everything you wear can have glitter on it, so use this time wisely. – If anything, New Year’s Eve is the opportunity to get together with good friends and party hardy, but it’s also the opportunity to meet some new people. Singles can especially benefit from going out on New Year’s Eve. – Staying in on New Year’s Eve means you miss out on the magic that happens during group dancing. Is there anything more fun than clearing a space on the dance floor for you and your crew to showcase the newest moves? Only when your friends are gathered around in a circle do you feel the confidence to break out “The Lawnmower”, “The Grocery Cart”, and/or “The Sprinkler”. – It’s safe to assume that by staying in on New Year’s Eve you’ll be missing out on the customary midnight balloon drop and glitter storm. You could recreate it in your home, but getting glitter out of carpet is no easy task. If you’re worried about the cost of NYE there are several free parties happening around the D this year. The 5th annual Motor City New Year’s Eve – The Drop is a free event that takes place in Campus Martius every year and comes highly rated. See, it is possible to celebrate New Year’s Eve without clearing out your wallet! here’s an up-to-date list on all the biggest parties going down in Metro Detroit. New Year’s Eve is the busiest night of the year for cabs and ridesharing apps. When the bars close in the wee hours of the New Year thousands of partygoers will be in search of a ride out of the city, and who knows how long you’ll be waiting for a driver. You can skip the age-old argument over who will be DD-ing. No one wants to be the designated driver, let alone of the biggest party night of the year. Keep everyone happy by cutting out the driving all together on NYE. A hotel room is less expensive than a ticket, accident, or DUI. Cops will be out full force on NYE, as will stupid people who choose to drink and get behind the wheel of a car. Ensure an incident free holiday by staying in a hotel near (or sharing the same building) of the event you plan on attending. A hotel room makes an already festive night considerably more special. NYE really feels like an event when you’re getting ready in a hotel room. It’s practically a mini vacation! A hotel room is an opportunity for romance or a passionate fling. Nothing energizes a relationship like alcohol and an evening in a hotel room, trust me. Is there anything more indulgent than waking up to room service after a satisfying night of debauchery? Any morning queasiness is quickly dispelled by coffee and breakfast in bed. Can you believe that less than a month remains of 2014!? Less than 30 days until the night where resolutions are made and midnight kisses are planned and sometimes unexpectedly stolen. Memories are made on New Year’s Eve, and oftentimes, the tone of that one night can set the tone for your entire year ahead. Planning beforehand can ensure that nothing gets in the way of your good time and can eliminate all of the possible hazards you may encounter during the evening. Safe transportation and/or a convenient hotel room within close proximity to your party will guarantee that you can have a great night, drink your fill, and still make it safely to your bed (or someone else’s bed, depending on how your night goes). Have you ever gone to a New Years Eve party at a hotel? Take it from us, there’s honestly nothing like it! No one has to volunteer to be the designated driver, there’s no struggle to find a cab, and you can enjoy closing out the bar at the end of the night. The elevators of the hotel are packed with fellow partygoers, so everywhere you turn, you can meet someone new. There’s a feeling of excitement in the air as everyone braces for the new year, making the evening a perfect occasion to make new friends or find yourself a crush. Is there anything more exhilarating (or is that frustrating?) than finding someone to kiss at midnight? New Years Eve is definitely the time to find love if you’re single in Detroit! On a night like New Years Eve, a hotel party tends to turn into a Vegas feel, or like one big slumber party for grown-ups. Of course, if the party gets too fun and you want to chill out for a few, the privacy of your own hotel room with a big comfy bed is right around the corner. No need to go out into the “Pure Michigan” cold or worry about coat check. No matter what you’re looking for, you should start the search early. Hotels in the city book up fast, and you don’t want to miss out on selecting a great party with a great hotel. 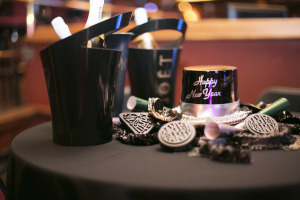 A listing of discount Detroit hotels for New Years Eve can be found at NYEdetroit.com, along with details on Detroit’s hottest NYE party, Resolution Ball 2015 at the historic Fillmore Detroit. Have multiple bottles of Champagne or sparkling wine on hand. 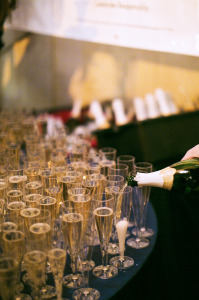 Ensure plenty of bubbly by asking your guests to each contribute a bottle. An added bonus will be all the varieties. Secure plenty of music. When you are creating a New Year’s Eve playlist, make sure you aren’t just catering to your taste in music. The perfect playlist joins together a variety of party staples, while introducing something new and unexpected. Try following Motown with Techno, or Disco with 90’s Hip Hop. Provide snacks. The burdens of a host are easily managed by asking your guests to contribute. When you send out your invitations specify that everyone should BYOB and bring a snack to contribute. Then all you have to worry about is presentation. Simply pull out plenty of bowls and trays to accommodate the bountiful harvest. Get to decorating. No one can deny that a party is made all the more festive with some tasteful (or tacky) decorations. Much like any hosting responsibility, you choose your level of commitment. Stick with silver and black streamers or up your game with a disco ball. Ring in the New Year with a BANG! Confetti poppers or sparklers add another layer of festivity, plus they’re just plain fun. Wear a killer outfit. The fashion rules for New Year’s Eve are almost nonexistent. Basically, anything goes. So pull out that metallic miniskirt and coat your nails with glitter! Get ready early. Is there anything more irritating than waiting on someone who isn’t ready to leave? Yeah, don’t be that universally detested person. Ensure yourself a ride home or reserve a hotel room. Negotiate a designated driver, find the number of a local cab company, download a ridesharing app, or make reservations at a hotel near the event you’ll be attending. Any option is better than a DUI. Dress in layers. New Year’s Eve may be a winter holiday, but parties can quickly become boiler rooms as people arrive. Wear a winter coat and leave it with the coat check. A thin sweater or blazer can be easily removed if the night heats up. Eat before you start drinking. Again, I implore you to not be that person. Remember that New Year’s Eve is a marathon, not a sprint.